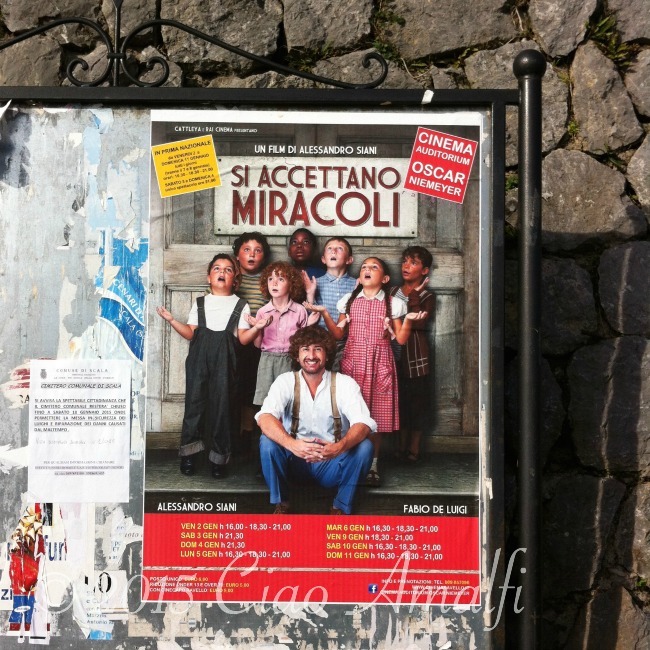 Si Accettano Miracoli – Now in Theaters! Today is the day! Oh, yeah, new year and all that jazz. But today is also the release in Italy of “Si Accettano Miracoli,” the movie by Alessandro Siani that was filmed on the Amalfi Coast last spring. Now I know that a lot of you reading this will be sad that you can’t see it right away, but do enjoy the trailer below and put it on your radar. If you’re in Italy, check it out at the movie theater. I’m really excited to see it, but not sure if I can make it to the showing on the Amalfi Coast. While there were other filming locations in Campania, a lot of the film was shot on the Amalfi Coast in Conca dei Marini, Atrani, Scala … and even my front yard! For about three weeks we had an up close view of how films are made as most of the equipment was stored in our garden along with lunch taking place right outside our windows, too. It was quite the experience! I had the chance to be an extra in some scenes shot in Atrani, which was really interesting. I hope you’ll get to see the film … it looks like a fun one! 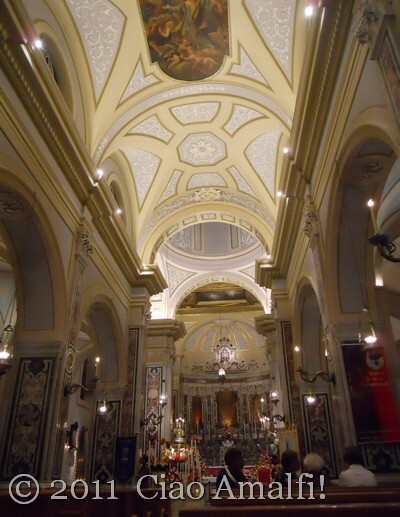 There are tons of great photos and videos on the Si Accettano Miracoli Facebook page if you’d like to see more. 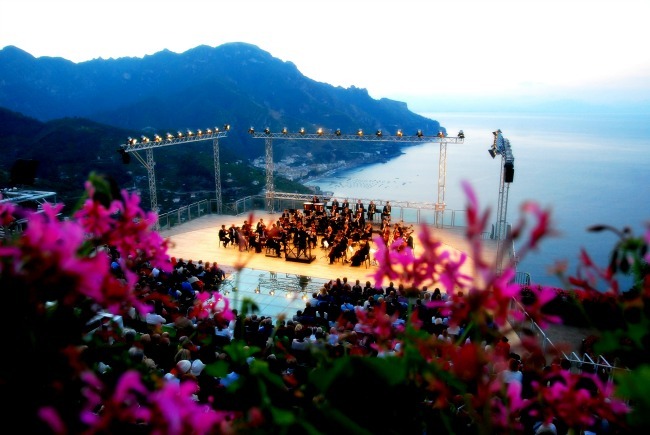 Every year the Ravello Festival is centered around a theme running through the art exhibitions, concerts and cultural events that take place during the summer. 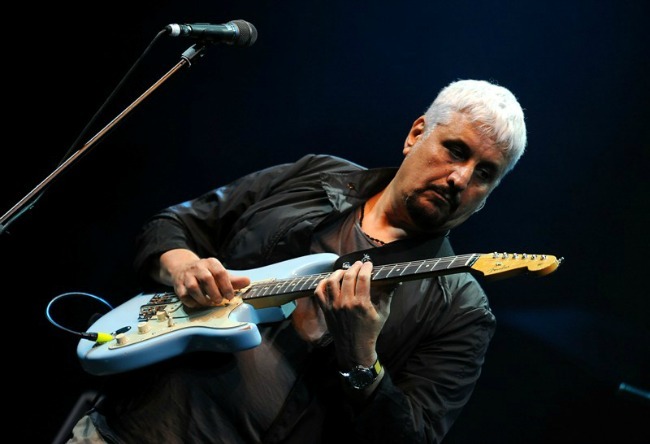 Memory is the theme of the 2012 Ravello Festival and the current exhibition Memoriae, Mitoraj a Ravello. The monumental sculptural works of Polish artist Igor Mitoraj are on display on the terrace of Ravello’s Auditorium Oscar Niemeyer, and the setting is spectacular. This is exactly what that grand space was created for, and I hope Memoriae will be the first of many exhibitions. I stopped by not long ago on a day when the sky was a brilliant, clear blue – the perfect backdrop for taking photos of the works on display. The exhibition Memoriae, Mitoraj a Ravello runs through September 8th, 2012. 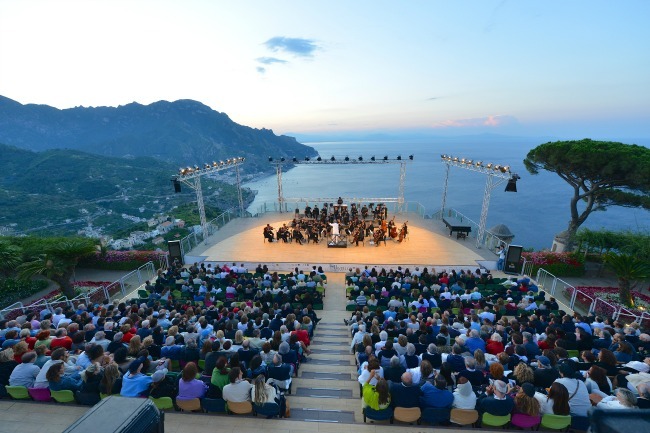 If your travels bring you to Ravello in the coming month, do walk the short distance from the center of town down to the Auditorium Oscar Niemeyer. If you miss the exhibition, don’t worry, Niemeyer’s striking modern architecture and the stunning backdrop aren’t going anywhere! 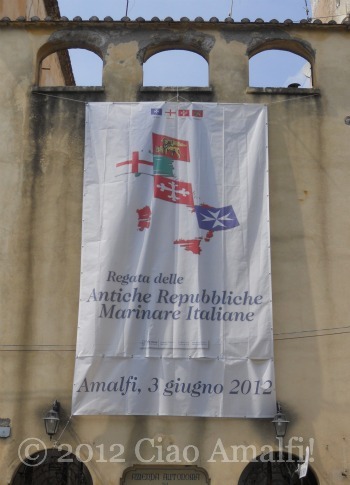 The Amalfi Coast woke up this morning to a sunny June day, picture perfect for the 57th Regata delle Antiche Repubbliche Marinare! Flags are flying all over town and it promises to be a fun day. We’re all ready for the regata! 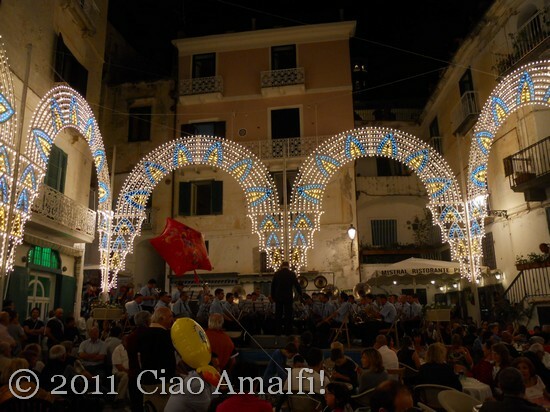 To share the festive spirit, here are some photos I took on Friday in Amalfi. I’ll share more photos of the historic parade and the boat race later this week. 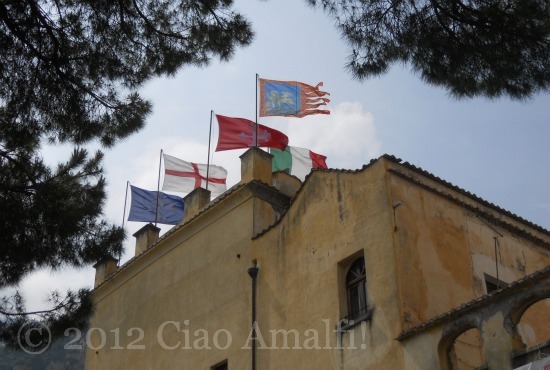 For the moment … FORZA AMALFI!!!! 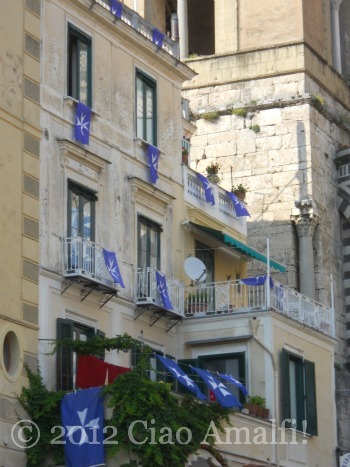 Forza Amalfi! 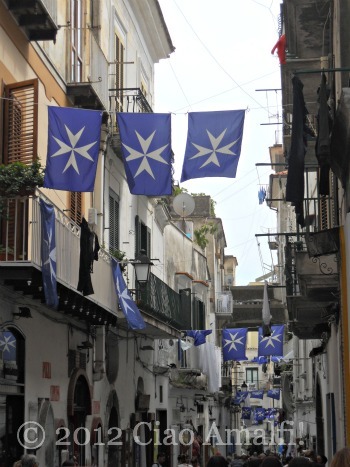 The main street of Amalfi decked out in flags. A festive bunch of flags at Marina Grande. Do you remember them all? 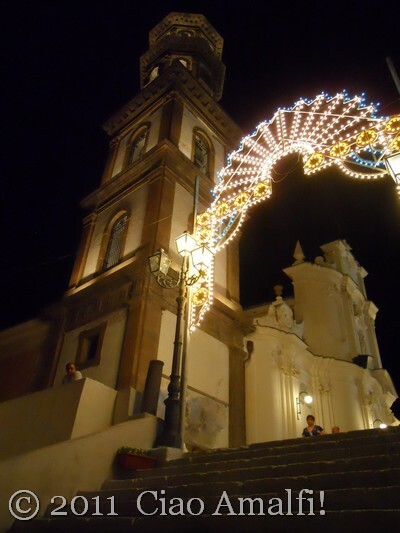 Every summer on July 22nd, the small town of Atrani celebrates Santa Maria Maddalena, or La Maddalena, with an evening of festivities that includes a religious procession, band concerts and a wonderful fireworks display over the sea after dark. 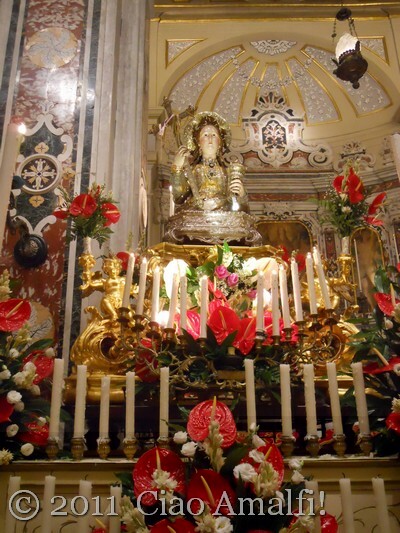 Last year I followed the procession of the statue of La Maddalena in Atrani, but took few pictures after dark of the celebrations and the fireworks. This year, armed with a new point and shoot Nikon I always carry with me, I was able to take some fun photos of the festivities to share. 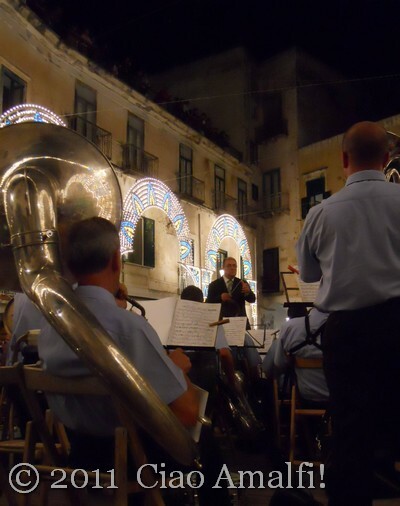 The sun has set and the marching band is already playing Puccini in Atrani’s crowded central piazza. 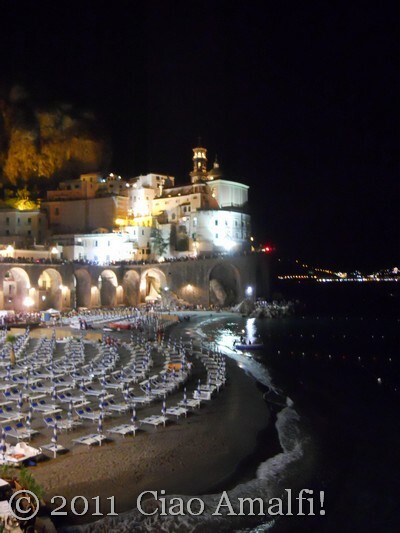 Come along and enjoy this lively summer night in Atrani! 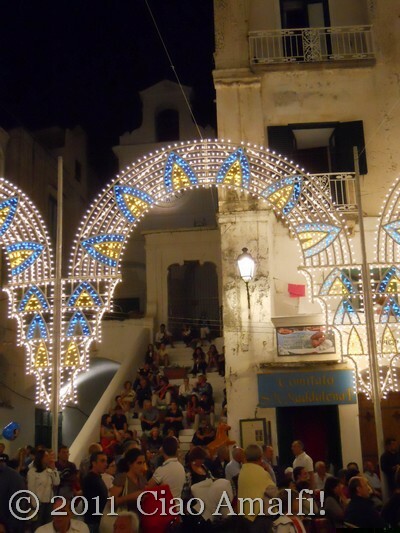 As the hour for the fireworks display nears, the road through Atrani becomes crowded with people jostling for the best spot. 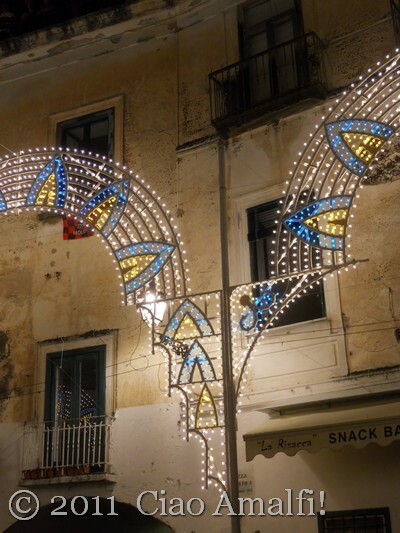 The fireworks in Atrani never fail to impress, and it seems like they come up with something to surprise me each year. This year they launched fireworks from the beach that glowed a funny green under the sea, while others exploded directly out of the water casting a beautiful light across the sea! The finale was a striking event, with fireworks shot off from the jetty and from a boat nearby. A bright and extravagent ending to a beautiful summer evening in Atrani!